Sometimes you go to your local pet store and can’t seem to find the right snack for your dog. You read every label and can’t tell if what you may be giving your dog is harmful or not. Throw in allergies, and anything else affecting your pooch, and you’re stuck in aisle 3 for more than half an hour with no firm decision in sight. What dog doesn’t like peanut butter? What about the sweetness of apples? 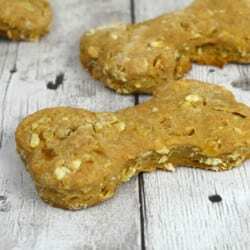 Give your pooch some love today and treat them to a great homemade snack that you know is safe.